No battleship became a cultural icon in the same way that the Imperial Japanese Navy’s Yamato did. The monstrous battleships of the first half of the twentieth were more than tools of national power; they constituted a nation’s strength, in both real and symbolic terms. The big warships continue to have a grip on our imagination. 2012’s Battleship performed poorly with critics and at the box office, but the eight battleships preserved around the United States continue to draw visitors. One, the USS Wisconsin, even served as the launch-pad for Representative Paul Ryan’s ascension to GOP vice presidential candidate. But no American battleship holds the same degree of cultural relevance as the Japanese Yamato. The largest battleship ever constructed, Yamato was completed shortly after the Pearl Harbor attack, displacing 63,000 tons, and carrying nine 18” guns. Sunk in desperate circumstances off Okinawa in 1945, she continues to exert a hold on the popular imagination in Japan. 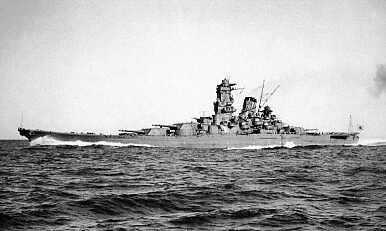 Although more powerful than their American counterparts (at least until the Iowa-class came into service), Yamato and Musashi were used cautiously by the Imperial Japanese Navy (IJN) for most of the war. Apart from a short, frustrating engagement off Samar, neither used her main armament in anger against Allied ships. Both were lost to swarms of American carrier aircraft, Musashi at Leyte Gulf and Yamato en route to Okinawa. Yamato’s loss came in epic fashion, as her last mission involved a suicide attack against American beachheads. Over 3,000 sailors died when she exploded and sank well short of her goal. For American audiences of a certain age, the most evocative depiction of Yamato came in the form of the animated television show “Star Blazers,” in which the Earth repurposed the hulk of Yamato to fight a series of galactic wars. Star Blazers was an edited and redubbed version of the Japanese “Space Battleship Yamato,” which made explicit reference to the lost battleship. In a pointed reference to Japan’s wartime experience, the first alien attack comes in the form of a radioactive bombardment that leaves the surface of the earth poisonous and desolate. Most of this escaped the notice of the American audience at the time, however. Memory of Yamato remains alive and well in Japan. Junya Sato directed a relatively successful film on the historical Yamato in 2005. In 2010, a live action version of “Space Battleship Yamato” performed very well in Japan, although it didn’t enjoy much cross-over success in the United States. A recent article by Shunechi Takekawa studied this issue in some depth. Yamato began appearing in Japanese film in the 1950s, and has remained a relatively popular subject for film, television, and manga since the 1970s. Takekawa argues that the stylized memory of Yamato provides a space for working out contradictory messages about Japanese nationalism, and about the historical experience of World War II. This goes well beyond a straightforward right-wing interpretation of Japanese nationalism, as the Yamato narrative evokes complex and contradictory understandings of the war, some of which even verge into left-wing pacifism. It perhaps shouldn’t be surprising that the colossal Yamato has become symbolic of multiple interpretations of Japan’s colonial period. Her construction represented a doomed effort to match and exceed the capabilities of the Western powers, and yet her entire career was characterized by dysfunction within the Japanese war machine. The final destruction of Yamato evokes a vision of heroic, but also pointless and futile, sacrifice. The bigger story, perhaps, is the enduring relevance of World War II to the construction of national identity within Asia. Not only the sheer drama, but also the machinery of the Second World War remain key mileposts in how nations define themselves. In this context, it’s surely unsurprising that more controversial elements of the legacy of World War II (including Yakusuni) continue to embitter Japan’s relations with the rest of Asia.